Our first photo for this week features a switchboard operator who is very focused on her job. I can’t quite make out the date on the calendar hanging on the wall – it might say 1938. 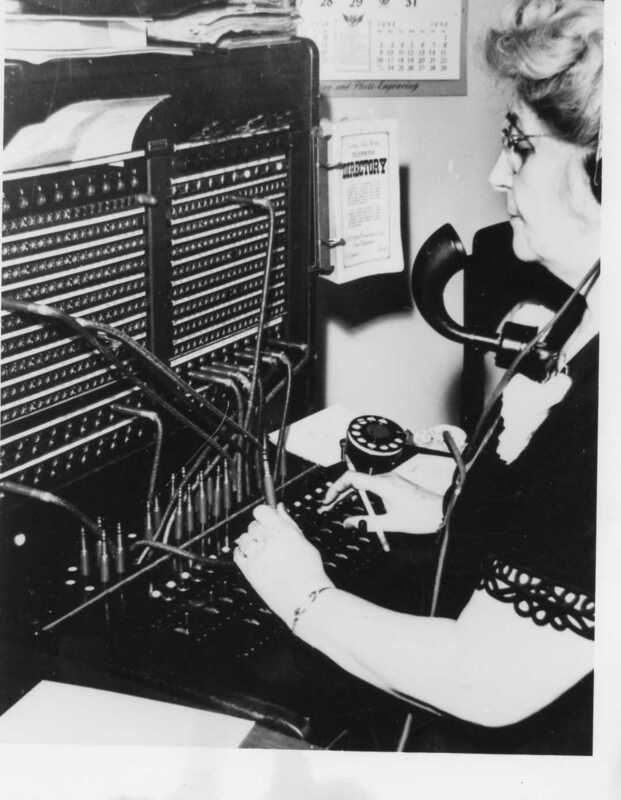 When and where the photo was taken locally is a mystery as is the name of the switchboard operator. If you recognize the lady in the photo and/or where the photo was taken – let us know! 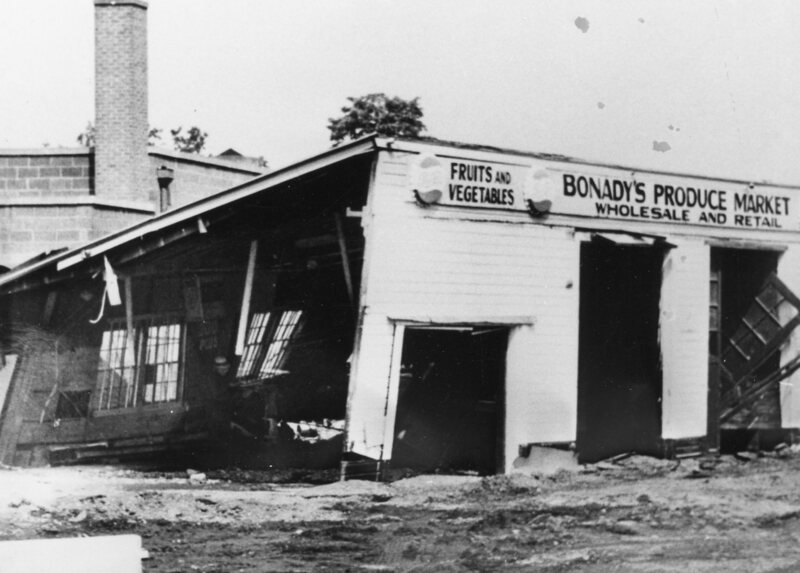 Our second photo for this week is of the old Bonady’s Produce Market in the aftermath of the flood. The building does look much worse for ware but the did rebuild. This is another photo taken in the aftermath of the Flood of ’72. And I selected the photo of the old tastee-freez because summer time is ice cream time! 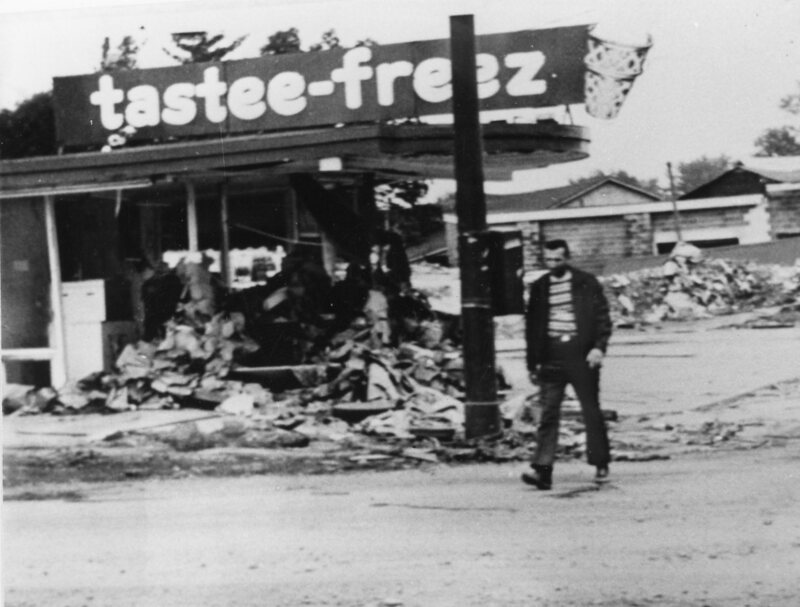 And I do recall getting ice cream at the tastee-freez before they demolished the building. July 20, 2018 July 20, 2018 Linda Reimer Baseball, Corning, Corning Free Academy, Corning NY, Flood of 1972, Flood of 72', Hurricane Agnes, Local History, New York State History, Public Library, Southeast Steuben County Library, Southern Tier. 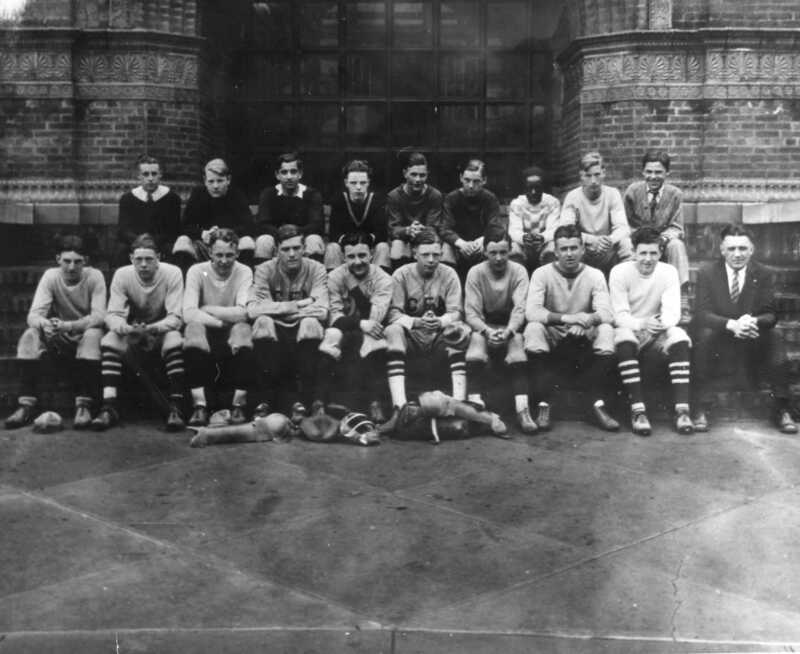 Our first photo for this week shows a baseball team in what appears to be the early twentieth century. I think the team might be sitting on the steps of Corning Free Academy – so they might be a C.F.A. baseball team from ages past. If you recognize anyone in the photo let us know! 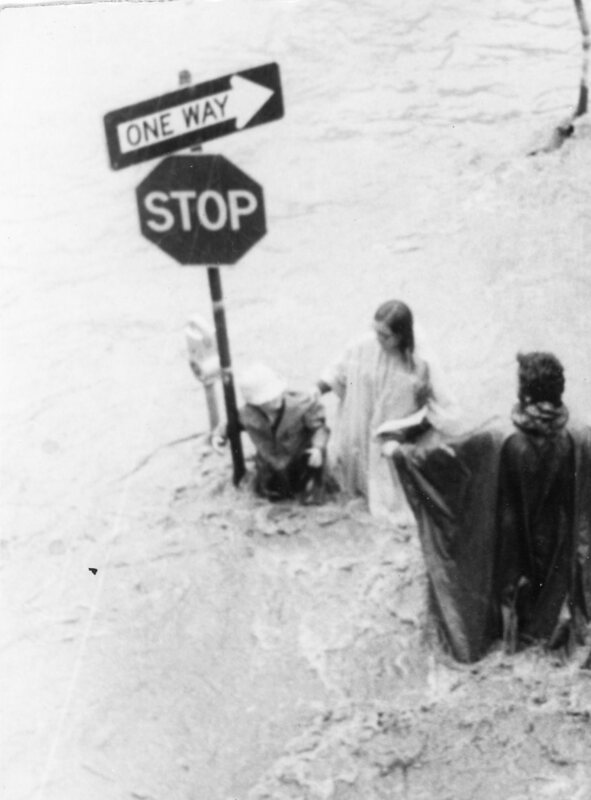 This photo is, apparently, one that was taken of a trio of people standing near a parking meter and a combo ONE WAY and STOP street sign during the Flood of ’72. And I say “apparently” , because there is another photo of the same group of people that appeared on the cover of the Star Gazette Souvenir Booklet titled “The Great Flood of ’72 In The Twin Tiers”, which was published on August 1, 1972. We have a copy of the booklet in our collection and it is worth checking out if you’re interested in the history of the Flood of ’72. As you can see, the photo in the library’s archive shows three people standing in flood waters near a parking meter and a combo STOP/ONE WAY street sign. The cover of the Star Gazette Souvenir Booklet seems to have been cropped as it shows only the two people standing closest to the parking meter and street sign – but it is obvious that photo too was taken on the same day and near the same time as the one in our archive. If you have any flood stories to share, or if you know who any of the people in this vintage flood photo or, or who Jerry Hendy is, please let us know! July 14, 2018 Linda Reimer Corning, Corning NY, Local History, New York State History, Public Library, Southeast Steuben County Library, Southern Tier. 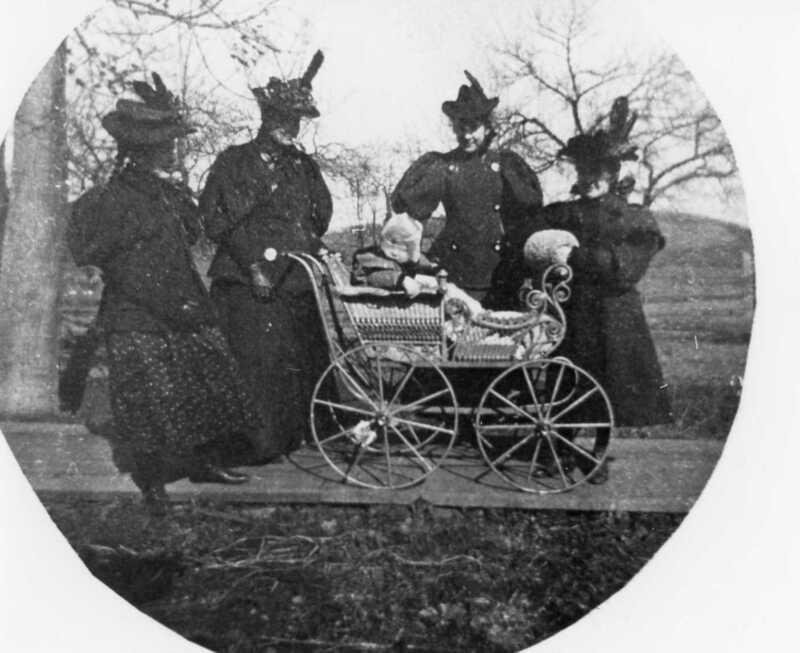 Our first photo shows a quartet of ladies, in very somber black attire, surrounding a baby in a carriage. The style of dress, which is, needless to say, much fancier than the street clothes we wear today, looks late 19th Century-ish in vintage. And by modern standards the baby in the carriage is having a very fancy ride! Also of note, the wooden plank side walk the group is standing on. I know that at one time Corning featured wooden sidewalks; however, when they were replaced by brick and later concrete walks is a mystery. If you know anything about the people in the photo, the history of wooden sidewalks in Corning or, if you wish to share any stories of the Corning area in days gone by – please do! Our second photo of the week is of an old postcard showing the Chemung River in the foreground and some of Corning Inc.’s old buildings in the background. 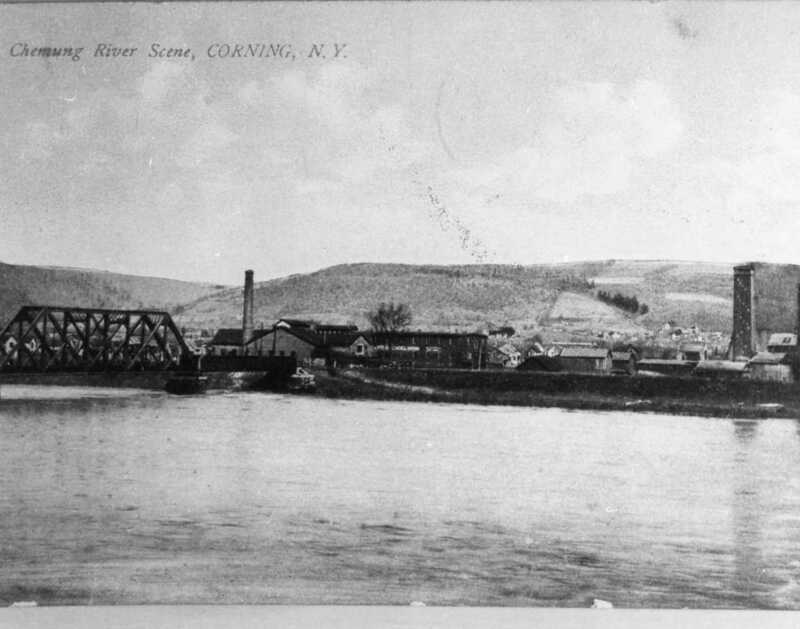 I’m certain the photographer was standing on the north side of the river as I believe Corning’s factory buildings have always been on the south side of the river. The date the photo was taken is a mystery. What a great postcard though! 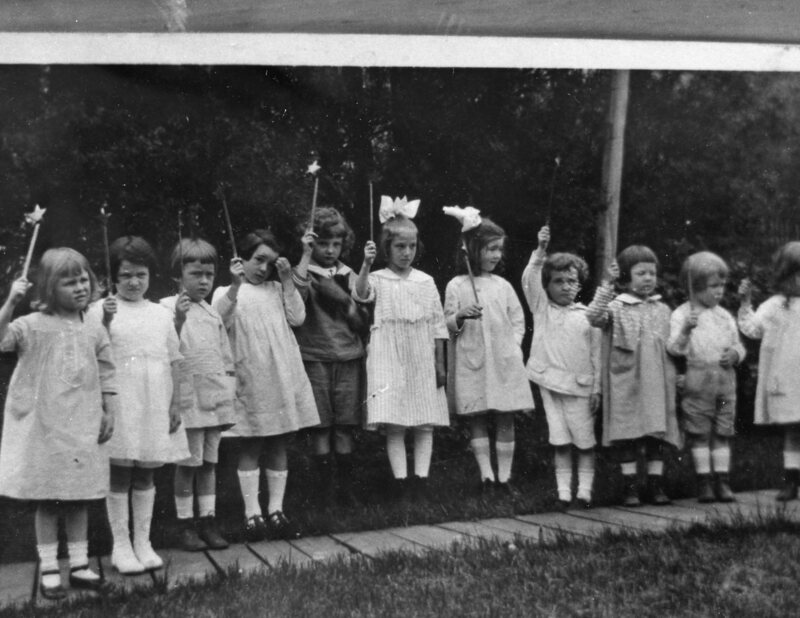 It offers us a great glimpse into the past as all our local history photos do. July 6, 2018 July 6, 2018 Linda Reimer Corning, Corning NY, Corning NY Corning NY, Corning Opera House, Local History, New York State History, Parade, Public Library, Southeast Steuben County Library, Southern Tier. Photo 1: Patriotic Parade Marchers? 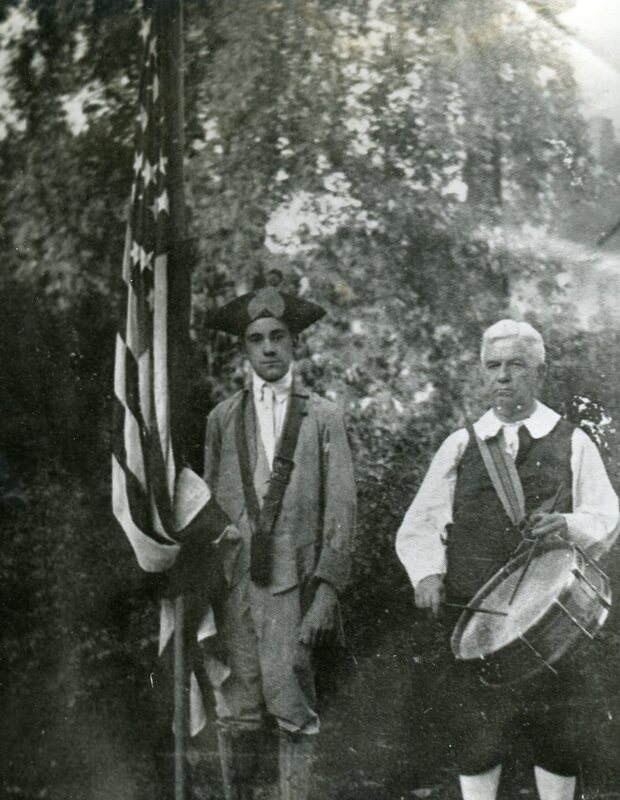 I’m going to guess that the two gentleman seen in the photo were marching in a long-ago parade. Perhaps on the 4th of July or Memorial Day? If you recognize either of the men in the photo, please let us know. Our second photo for this week is another photo we have that appears to have been take of a photo. This one shows the old Corning Opera House. 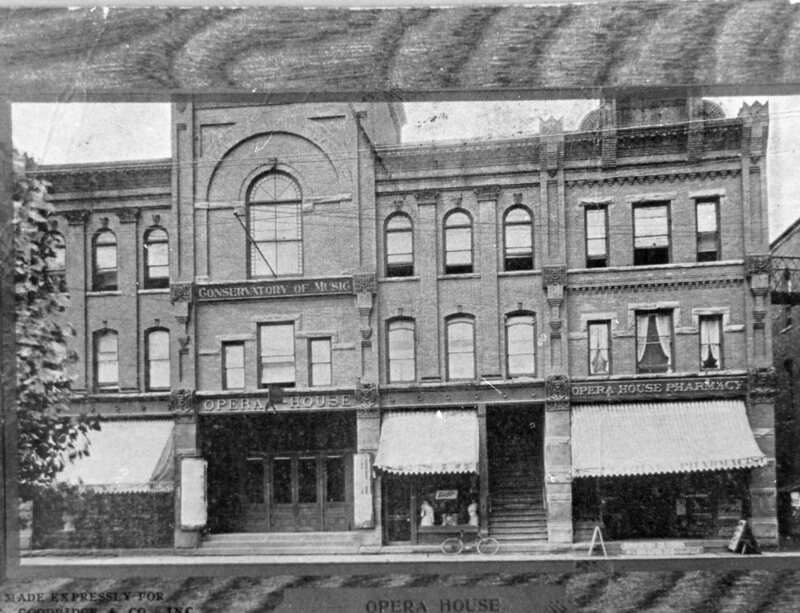 I’m not sure when the opera house was torn down, as it was before my time, but I’m guessing sometime prior to the 1950s or whenever the Woolworths store was built on that block of Pine Street in Corning. If you have any stories about the old Corning Opera House please let us know! 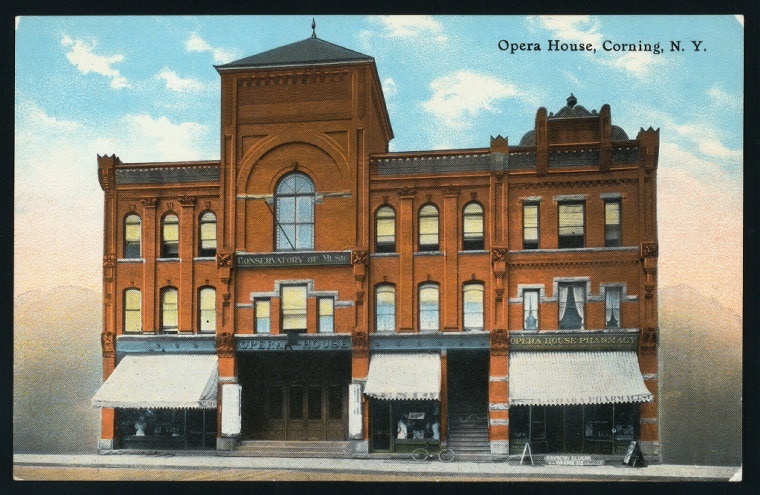 The Library of Congress has a free digital collection of images that you can download — including this photo of a postcard of the old Corning Opera House – which is neat!